In a city rife with landmarks and a history that stretches back centuries, it's refreshing to discover the modern side of Dublin. 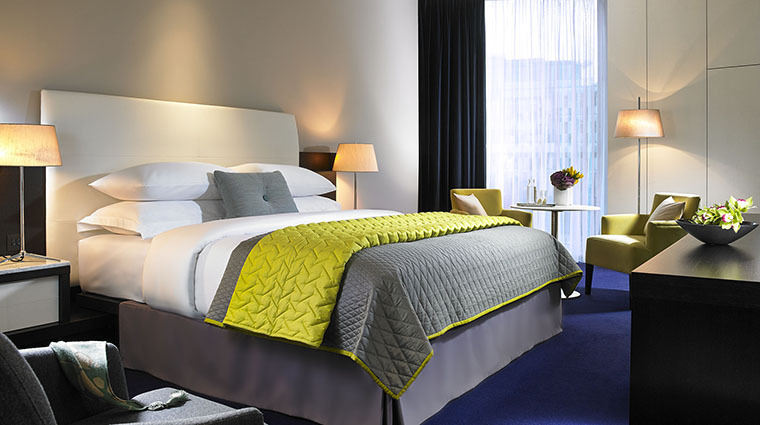 One place you’ll find it is at The Marker Hotel, opened in 2013 on the edge of the Grand Canal in a neighborhood lovingly called the Silicon Docks. 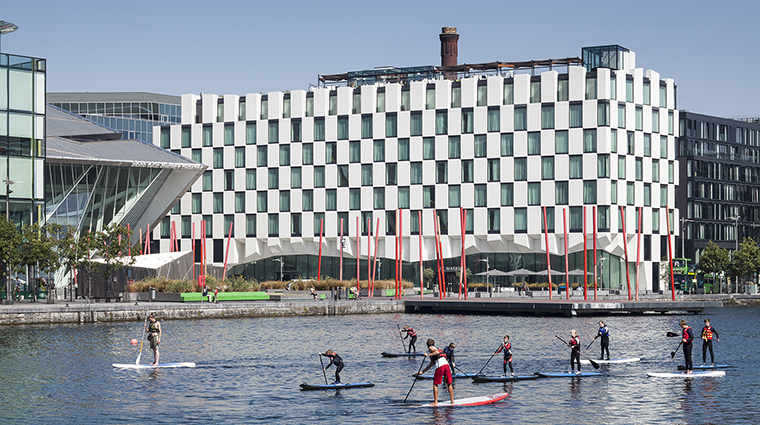 The whole area boasts a contemporary-chic vibe complete with one-of-a-kind art installations, the Bord Gáis Energy Theatre and technology businesses peeking around every corner. Despite the setting, The Marker’s actual building speaks more to Ireland’s natural surroudings. For example, the checkerboard facade is an ode to the hexagonal stones of the Giant's Causeway. The name pays homage to the country, and comes from the historical marker in the Grand Canal that dictated the end of the trade route. In this way, the Marker showcases both a love for the island while tipping a hat to its future. Situated only 25 minutes from Dublin Airport, within walking distance to many tourist spots and in the heart of the technology work center, one of The Marker's best assets is location. With three onsite eateries and a superb spa complete with a glass-like infinity pool inside the facility, staying in proves an excellent option. Be sure to spend some time in the luxurious spa. Book a muscle melt massage, a treatment that utilizes a special blend of muscle-warming ingredients such as black pepper and Spanish rosemary. 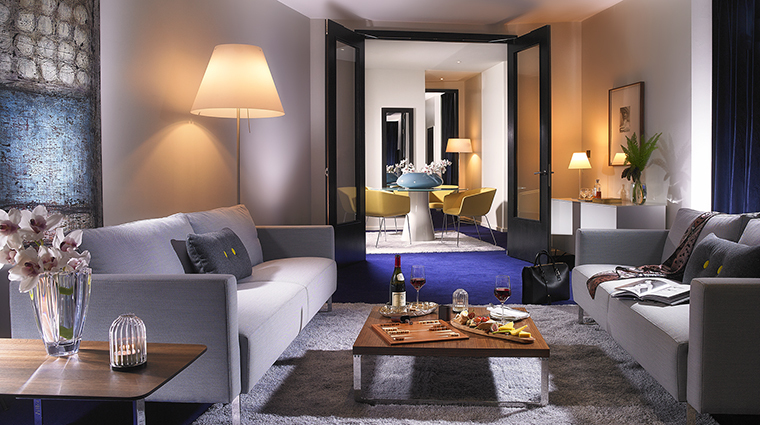 The thoroughly modern rooms feature unique pieces. Your space may have an artsy Andreu white glass pedestal table, a Philippe Starck Flos D’E lamp or Eames-style Task Chair, helping to showcase the property's dedication to style and art. The luxury hotel boasts one of the only rooftop lounges in the city. 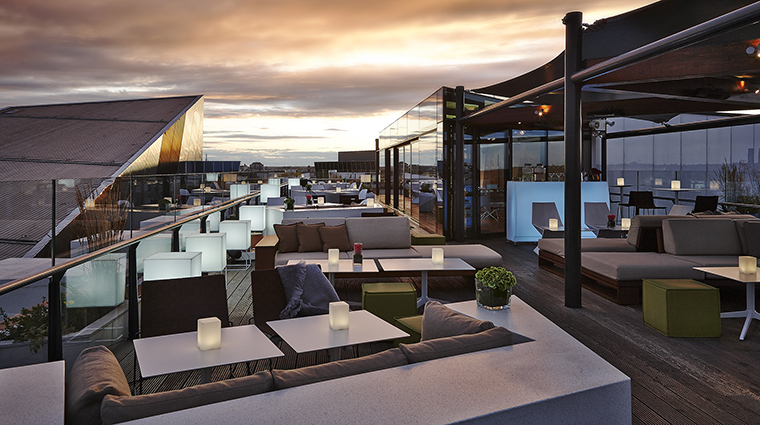 Enjoy a glass of wine, craft cocktail or beer and small plates while looking out over Dublin and toward the sea. In addition to the pool and spa, the Dublin hotel also offers a full gym and a eucalyptus-scented steam room. No matter where you dine in The Marker Hotel, don't pass up the selection of handcrafted Irish cheese, a tray that you won't easily find outside of the country. Take advantage of locally inspired treatments at the spa. The refresher facial, for example, uses organic Moor mud, an ingredient native to the area. 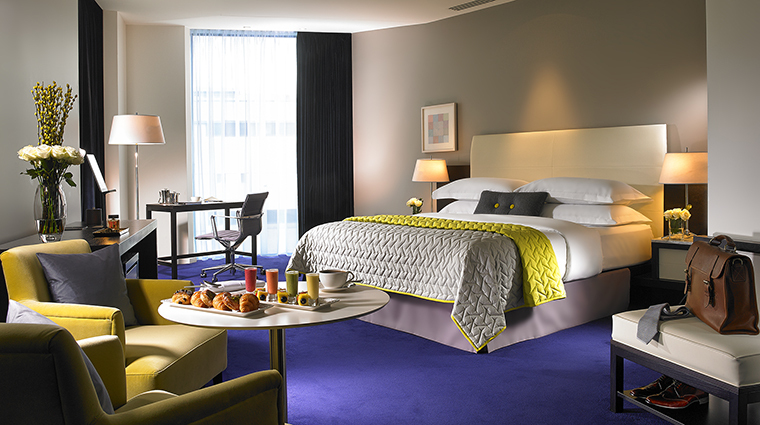 Each room overlooks either Grand Canal Square, the Docklands, the Wicklow mountains or Dublin itself. Bold and cool colors accent the slate tones—your room might have sparks of lime green, cobalt blue and aquamarine to give it a bit of a pop. Cozy blankets, armchairs, a luscious bed and floor-to-ceiling windows give the rooms a livable feeling, making it a great option for those who like to mix business with pleasure. Another stunning feature is the Italian Carrara and Black Nero Marquina marble bathrooms. They come with sleek Villeroy and Boch sinks and showers, and Malin + Goetz bath products. The Marker's signature eatery, The Brasserie, is not to be missed. This casual yet upscale restaurant located right in the lobby focuses on locally sourced produce and Irish cuisine with a modern twist, of course. Chef Gareth Mullins helms the kitchen, churning out dishes such as chestnut gnocchi with apple cider jam, ham hock and black pudding terrine, red wine poached brill with black lentils and buttermilk mashed potatoes. You can also opt to enjoy a meal, along with a classic cocktail, at the cozy Maker Bar. The kitchen dishes out classic Irish fare and a dessert list sure to spark any sweet tooth. While the bar definitely serves up great cocktails, it also whips up a healthy spa menu of fresh pressed juices, smoothies and salads.